Elmer Booth, foreground, and Harry Carey, Sr.
A lot happens here in 1,000 feet of film. The Musketeers of Pig Alley is the first gangster film, but it’s much more. Here, director D.W. Griffith uses an approach that allows for moral complexity and realism, and his director of photography Billy Bitzer uses techniques such as isolated focus and erratic framing to create new ways of seeing. Film as an art with its own unique set of techniques advances demonstrably here. It’s a story set in the slums of New York, but it’s not a symbolic story like Griffith’s earlier A Corner in Wheat, nor a melodramatic like the urban expose The Cry of the Children. It’s gritty and dark, despite its nominally happy ending. There are loose ends and dead ends in the script, the first by the prolific Anita Loos, herself one of the first professional screenwriters, but they give this short story in film the extra dimensionality of strangeness. In a nutshell, the story concerns a struggling young musician and his wife. They live in poverty with her mother, who dies at the three-minute mark, seemingly just to underscore the misery. The husband is robbed; the robber later saves the musician’s wife from being drugged at “the gangster’s ball,” which a female friend drags her to while her husband is working. Providentially, the husband recovers his wallet during a shootout between two rival gangs; the couple give the friendly robber an alibi in return. Among the film’s virtues are a grim attention to detail, and a general underplaying that was rare at the time. Crime had been the subject of film before, but this movie takes us directly to the lowest level of society, the crowded alley. In the final seconds, a title reads “LINKS IN THE SYSTEM” and shows the gangster taking money from, and seeming to agree to do the bidding of, an off-screen hand. It seems like a strange, disconnected, menacing moment – right before we snap back to the final sight of the embracing couple. 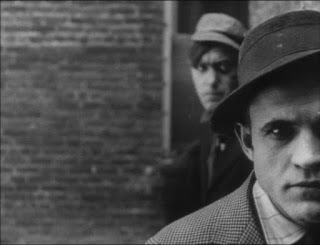 A lot has been written about the performance of Elmer Booth as the chain-smoking, cocky gang leader Snapper Kid. His tough, nervy, hyperactive characterization was much different from the mysterious villains of the past. It’s said to have influenced Cagney and others. Unfortunately, Booth was riding in the car the drunken up-and-coming director Tod Browning drove full-speed into the side of a train on June 16, 1915, and was killed instantly. A handful of important actors appear here. Lillian Gish plays the lead; Harry Carey Sr. is Snapper’s sidekick, Bobby Harron, who was to be a leading man for Griffith until his untimely and unexplained death in 1920, is a rival gang leader; and Dorothy Gish, Lionel Barrymore, and Donald Crisp lurk around the edges of the screen. Tackling the nitty-gritty was a bold move that would find flower later in silent features such as Underworld and The Racket, and culminate in the crime sagas of the early talkies.